SWEDEN: Vestas will supply 84 turbines for two wind farms in central Sweden with a combined capacity of 353MW as pension fund PKA makes its first move in to onshore. The 50-turbine Blakliden and 34-turbine Fäbodberget sites will be situated in Åsele and Lycksele municipalities respectively and are due to be commissioned in the fourth quarter of 2021. 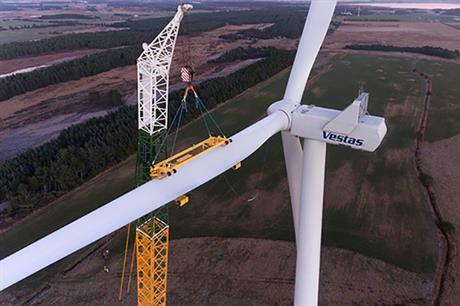 As well as supplying 84 of its V136-4.2 turbines for the projects, Vestas will also take a 40% holding in them. The manufacturer will maintain the turbines for 25 years and delivery is expected in the first half of 2021, Vestas added. Swedish developer Vattenfall and Danish pension fund PKA will each hold a 30% stake in the two Swedish projects. PKA owns a quarter of the world's largest operating offshore wind site, the 659MW Walney Extension in the UK. Peter Damgaard, CEO of PKA, which has previously invested in at least three other offshore wind sites, said: "The model created for this investment can be copied to other similar investments as we have seen with our investments in offshore wind parks. "We focus on these type of investments because we continue to find interesting opportunities in combining good returns to our members with mitigation of climate change." The 210MW Blakliden and 142.8MW Fäbodberget represent PKA’s first investment in onshore wind. Damgaard added: "For us, it is good business and common sense, and we therefore don’t expect this to be our last investment in onshore wind." Construction of Blakliden and Fäbodberget will cost around €350 million, Vestas stated. This will be partially funded by non-recourse project financing, and financial close is expected "in the coming months", it added. Norsk Hydro has signed a 20-year power purchase agreement (PPA) for power from the two projects, it announced. It will buy 0.66TWh/year between 2022 and 2041 to power its aluminium plants in Norway.